In 2010, the U.S. Treasury Secretary Timothy Geithner wrote a letter to G-20 finance ministers. Concerned about the growth in current account imbalances between 2000 and 2007, he recommended a radical approach: that each G-20 country pledge to keep current account surpluses and deficits within 4 percent of GDP (Davies, 2010). Geithner’s idea was politely rejected. But what he tried to do highlighted the level of concern among policymakers over the growth in global current account and trade imbalances since 2000. These political concerns have intensified significantly since the election of Donald Trump as President of the U.S. (see Donnan, 2017). International discussions on global imbalances are helpful to policymakers in understanding the overall effects of their policies, how others view their policies, how policies affect one another and so on. So I think those discussions were useful—Ben Bernanke, former Chair of the Federal Reserve, United States, interviewed August 7, 2017. The current account measures the difference between the level of domestic savings and investment in an economy. Many East Asian and European economies have large current account surpluses because they generate more savings than investment opportunities, the former in periods of exceptional growth, the latter in maturity. This surplus of savings goes overseas and finances investment in economies, which are in the opposite situation: Economies that have more investment opportunities than they have domestic savings to finance them. These economies, such as the U.S., United Kingdom, and Australia, have current account deficits. Having a current account deficit or surplus is not necessarily a bad thing. A country might run a current account deficit because it has strong future development prospects, encouraging its citizens to smooth consumption by borrowing today in anticipation of a prosperous tomorrow. Conversely, a country might run a current account surplus because it has an aging population, which is saving for retirement or because it has a mature economy with fewer investment opportunities such that its savers explore opportunities offshore. But economists such as Maurice Obstfeld1, Kenneth Rogoff2, Ben Bernanke3, and Mervyn King4 argue that the rise in global imbalances (Figure 1) was intimately linked, if not a key cause of, the global financial crisis by fueling unsustainable booms in credit and asset prices. More recently, Brad Sester from the Council on Foreign Relations has suggested that global imbalances might be a critical contributor to depressed global interest rates, with implications for long-run stability (Sester, 2016). Current account imbalances can be particularly problematic for deficit economies. Growing deficits raise the risk of a “sudden stop”—a change in sentiment where investors suddenly become unwilling to finance a country’s deficit. International linkages and poor cross-border processes for the resolution of troubled banks and financial institutions mean sudden stops can quickly become global events. Similarly, Olivier Blanchard and Gian Maria Milesi-Ferretti (2011) have warned that current account imbalances are, in many instances, not benign because they are being driven by domestic distortions. For deficit economies, these distortions can include poorly regulated financial systems that fuel asset price bubbles or irresponsible fiscal authorities reducing national savings through excessive spending. For surplus countries, distortions can take the form of a lack of social insurance driving up precautionary saving or inefficient financial intermediation leading to low investment. The G-20 has been largely ineffective on global imbalances. It failed to create a new political consensus that you cannot simply have permanently exporting countries without creating significant imbalances for the rest of the world, which, ultimately, creates problems in financial, trade and political systems—Kevin Rudd, 26th Prime Minister of Australia, interviewed September 8, 2017. Our argument at the Bank of England for reducing global imbalances is that countries could focus more on liberalizing trade in services. The countries that tend to have the largest trade deficits in goods, such as the United States, also tend to have a comparative advantage in the export of services. Liberalization of services trade would help some economies reduce their trade deficits—Mark Carney, Governor of the Bank of England and Chair of the Financial Stability Board, interviewed February 16, 2018. G-20 leaders tasked finance ministers and central bank governors to develop indicative guidelines to identify the nature and root causes of global imbalances. They used the G-20’s mutual assessment process to develop and monitor country-specific commitments to reduce these imbalances overtime. The imbalances they identified included public debt and deficits as well as private saving and private debt6. But over time, the G-20’s concern has been primarily focused on current accounts and, more specifically, on three countries, and three policy recommendations, in particular (G-20, 2010). I set out to President Obama what I meant by a global compact to which each continent would sign up. That would require coordinated action: first on imbalances, then on currency reserves, then on monetary and fiscal policies, and then, if possible, on trade—Gordon Brown, former Prime Minister of the United Kingdom7. The first is the U.S. and its growing fiscal deficit. Among other things, it was argued that the fiscal deficit has acted to reduce national savings in the U.S., worsening its large current account deficit (Figure 1). The second is Germany and what the IMF (2017) argues is insufficient government spending on infrastructure. Reduced government spending means higher national savings, lower investment and a larger current account surplus. Many have also argued that increased spending in Germany would help with the economic recovery in the eurozone periphery (see Krugman, 2017). The third is China and its low level of consumption as a percent of GDP. 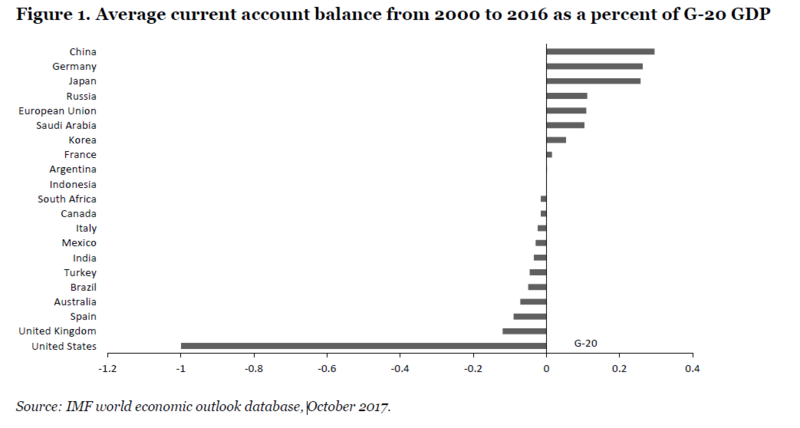 While China’s current account surplus has narrowed significantly since 2007 (discussed in the following section), the Chinese government and the G-20 remain focused on the need to rebalance the Chinese economy to increase domestic consumption and reduce savings that, in turn, means a smaller current account surplus. But how successful has the G-20 been in reducing global imbalances? Have the discussions and commitments in the G-20 changed the domestic policies of G-20 countries or did countries simply do what they would have done anyway? And, if the G-20 did implement its agenda, has it identified the right policies? Would these policies reduce global current account imbalances if they were implemented and, if so, at what cost? To answer these questions, Section 2 starts by looking at the trends in global current account imbalances since 2000. It looks at whether the G-20 has been successful in reducing global current account imbalances and which countries have done the heavy lifting. Section 3 explores whether the G-20’s policy agenda is the right one for reducing global imbalances and whether it might result in any unintended consequences. It introduces the G-Cubed (G-20) model: a multi-country, multi-sector, intertemporal computable general equilibrium model, detailed in McKibbin and Triggs (2018). Using this model, Section 3 simulates the impact of fiscal consolidation in the U.S., increased infrastructure investment in Germany, increased consumption in China and the impact of all three policies occurring simultaneously. It shows that the G-20’s agenda does not necessarily achieve the desired outcome of reducing global current account imbalances, depending on how the reforms are sequenced. Furthermore, when imbalances are reduced, this often comes at the cost of the real economy. The results also provide a compelling explanation for some of the shifts in global current accounts that have been observed since 2007. Section 4 then uses the results from in-depth interviews with 61 politicians and officials from across all G-20 countries to explore whether the G-20’s agenda on global imbalances has influenced domestic policies or not. Participants included Kevin Rudd, Janet Yellen, Haruhiko Kuroda, Ben Bernanke, Jack Lew, Mark Carney, and 55 other politicians and officials to whom I am deeply grateful. The results suggest the G-20’s influence has not been strong. However, the results highlight several ways in which the G-20’s influence could be strengthened. Section 5 concludes with a discussion on how the G-20’s agenda could be reformed to reduce global imbalances into the future. See Obstefeld and Rogoff (2009). In 2003, the G-7 warned there were significant risks posed by large imbalances between countries. In 2004, the European Central Bank voiced concern that the large and growing current account deficit in the United States posed significant risks for global financial stability. In 2005, Alan Greenspan added his voice to these concerns, warning that the United States current account deficit “could not widen forever.” In June 2007, the IMF’s first multilateral consultation looked at this issue. Talks included China, the euro area, Japan, Saudi Arabia and the United States. All countries agreed that reducing global imbalances was a multilateral challenge, and that resolving them in a manner compatible with sustained growth was a shared responsibility. They stressed that an orderly unwinding of imbalances was in the interest of the world economy, including because sustained imbalances in trade and current accounts could result in a sharp rise in protectionism. The also identified the key culprits in each of these areas. These were China (high private saving and external surplus), France (high external deficit and public debt), Germany (high public debt and external surplus), India (high private saving and fiscal deficits), Japan (high public debt and private saving), the United States (large fiscal and external deficits), the United Kingdom (low private saving and high public debt), the euro area (external surplus and public sector debt), and Spain (external surplus and high public sector debt).